The Small Grains Crop and Pest Survey is well underway now in Minnesota and North Dakota. There is a link in the right hand column that will take you to all the survey maps. Or, you can go directly to wheat and barley postings. Maps will usually be updated and available on-line by Tuesday. Maps will summarize observations from the previous two (2) weeks. Currently, the maps for May 26 to June 6, 2014 are available. Certainly with the late start for the season, we can see that the crop growth stage is lagging behind. The majority of the fields in NW MN are in the early leaf stages. Fields in west central and southwest are in the tillering to jointing stages. In general, the fields look good with very little pest activity. 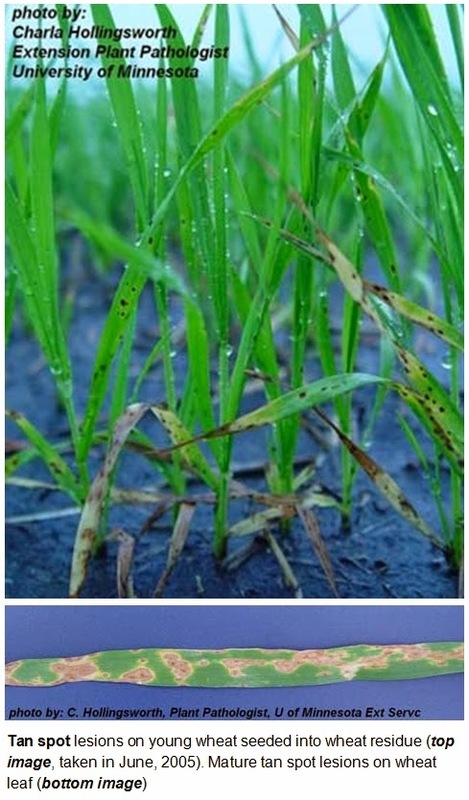 Tan spot has been the only small grain disease detected at levels of interest on wheat and barley around the state. The following comments are from Dr. Madeleine Smith, Small Grains Plant Pathologist, NWROC - Crookston. Tan spot is identifiable by the brown spots often surrounded by a yellow halo that appear on leaves. This may run together to form larger patches of yellowing and browning (see mature lesions to the left). Initial infections in young seedlings often result in yellowing of leaf tips as the seedlings react to the toxins produced by this fungus. Tan spot will be particularly prevalent on previous wheat ground. Be careful not to mistake nitrogen deficiency or symptoms of BYDV for tan spot. Scouting is really key with these diseases and results in early detection. As tan spot can go through multiple infection cycles in a season, it is important to control it as soon as it is identified. If left unchecked, this disease will continue to progress and may impact yield. If you do see tan spot, you can use a tank mix of herbicide and fungicide to control this disease. With the young crop, we recommend using half the labeled rate of products containing active ingredients such as propiconazole (e.g. Tilt). This is because there is less biomass at this stage for the fungicide to cover. After application of fungicide, the lesions of tan spot will not disappear, but the fungus in these lesions will have been killed off. It is important to keep scouting new growth in fields to determine if new infections are occurring. If so, an application of fungicide later in the season may be necessary. A number of different fungicides can be used for control of this disease (see current fungicide efficacy table for small grains). Always remember to follow current labeling instructions for use. This year, we are interested in collecting isolates of Tan Spot. So if found, please contact me at smit7273@umn.edu BEFORE you spray and we will try to collect a sample.